The hashtag #startuplife is on the rise. For the last few years, we have seen how aspiring entrepreneurs have taken the tech industry by storm with their unicorn companies. Back then, startup was often underestimated because people believed that they have no future in the long term. But now, more and more entrepreneurs are proving that it is just a matter of time for startup to get to the top. E-commerce giant Alibaba Group, for instance, initially only had 18 employees at the beginning of its establishment in 1999. Nearly two decades later, Alibaba has more than 50 thousand employees by 2017. Originally started with a small team struggling to survive in the harsh business environment, today Alibaba has transformed into the biggest online shopping in the world. With the proliferation of young startup in various parts of the world including Southeast Asia, it comes as no surprise that then working at startup becomes an attractive option for fresh-graduates besides toiling at big corporates. For Millennials who are seeking for meaningful work, joining a startup team can provide an opportunity for them to contribute in building a better future. On top of that, startup is also known for its compassionate company culture and cool perks. These newly-born companies often offer flexibility and agility in the workplace for the employees by giving them freedom to manage their own work arrangements, and even remotely work from their home. Additionally, the work environment is designed as comfortable as possible so that employees feel contented, motivated in working, and increase their level of creativity. Departing from the vision to help bring together talents with their dream startup, Startup Jobs Asia (SUJ) is a niche job site that specifically provides job seekers with information about job vacancies, and provides a way for founders to find their co-founders. With more than 100,000 active users, Startup Jobs Asia’s coverage area includes Southeast Asia and its surrounding areas, ranging from Singapore, Malaysia, Korea, Hong Kong, to Australia and New Zealand. There are good chances that most people still recognise startup as technology-related company. However, this perception is not entirely wrong. Because startup is dealing with new technology such as computer and smartphone, it is not surprising that many job openings are available for those who possess skills in that field. 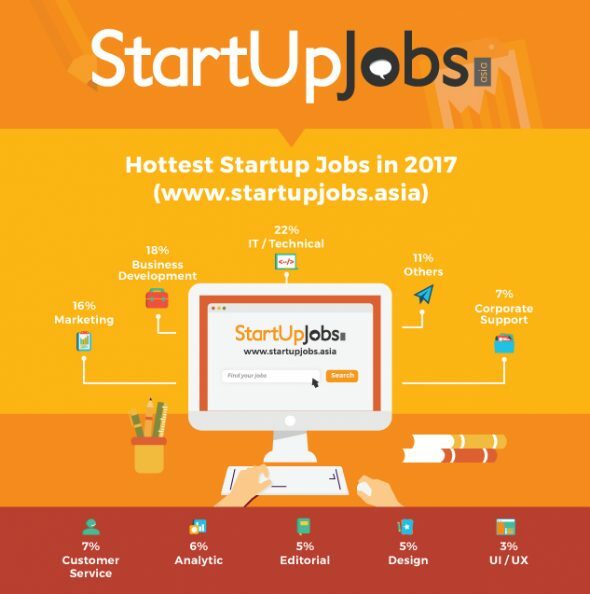 Based on statistics taken from the website www.startupjobs.asia, IT or technical jobs remains highly-sought after position for talents. IT or Technical jobs is leading the list of top 10 hottest startup jobs with 22 percent, followed by Business Development jobs 18 percent, and Marketing jobs 16 percent. Jobs under Others category which include finance, candidate acquisition specialist, and account executive takes the fourth place with 11 percent, and Corporate Support with 7 percent. Other jobs included in the list are Customer Service (7 percent), Analytics (6 percent), Editorial (5 percent), Design (5 percent), and UI/UX (3 percent). When we break down the IT or Technical category into specific job roles, Full-Stack Developer tops the list with almost half of candidates (42 percent) send their resumes to apply for the position. Along with digital transformation, more and more organisations are strengthening their online presence and expanding business by developing their websites. 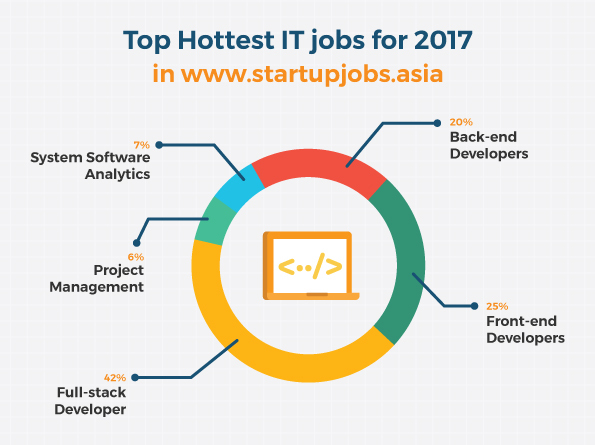 Following behind of hottest IT jobs for 2017 are Front-end Developers (25 percent) and Back-end Developers (20 percent). Also in the list are System Software Analytics (7 percent) and Project Management (6 percent). 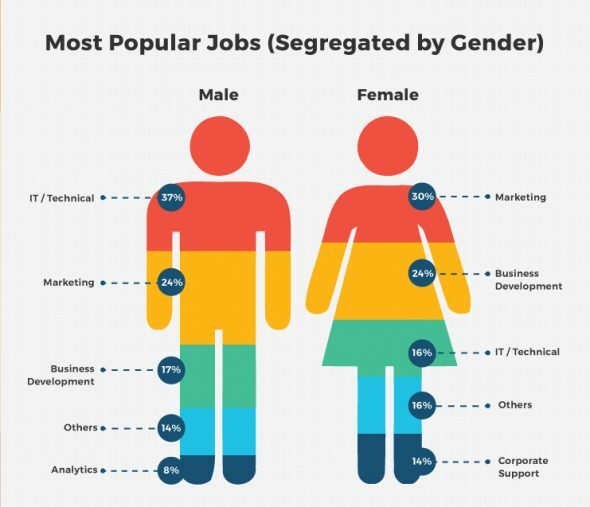 When it comes to Most Popular Jobs segregated by gender, there remains difference between male and female’s preference in applying for jobs. Based on the data compiled from Startup Jobs Asia, more than one-third male applicants (37 percent) send their resume for IT or Technical jobs, while almost one-third female applicants (30 percent) opt to work for Marketing jobs. Marketing comes as the second place for male applicants (24 percent), followed by Business Development (17 percent), Others (14 percent), and Analytics (8 percent). Meanwhile, Business Development comes as the second place for female applicants with 24 percent, then followed by IT or Technical (16 percent), Others (16 percent), and Corporate Support (14 percent). Startup Jobs Asia was “brewing” yet recognizing the challenges of Talent Acquisition that Startups faced both in Singapore and within Asia. We have identified the in-between gaps and aim to drive through them to bridge the gaps narrower as we move forward. With decades of combined experience in recruitment, we understand the challenges that Startups and jobseekers face today. We aim to create a better leverage and platform for Startup Hire in Asia and help connect the right talent fit within their growing and emerging business. We want to “sexify jobs @ startups and to grow the human capital eco-system for startup.” In short, we want to be the voice for startup hire within asia. Pros and Cons of Working for a Start-Up: What to Expect and Not to Expect on Job?